يشكل Toscana Village Resort بموقعه الممتاز في Whitsunday Islands نقطة انطلاق جيدة لاستكشاف هذه المدينة النابضة بالحياة. يسهل الوصول إلى هذا الفندق ذو 4 نجوم من المطار، فهو يبعد عنه مسافة 47km فقط. يضفي محيط الفندق اللطيف وقربه من The Doctors Airlie Beach, Whitsunday Doctors Service, Boathaven Beach سحراً خاصاً على هذا الفندق. يعمل Toscana Village Resort على ضمان إقامة مريحة لضيوفه من خلال خدماته الممتازة وحسن ضيافته. إن واي فاي مجاني في جميع الغرف, تخزين الأمتعة, واي فاي في المناطق العامة, صف السيارات, التوصيل من وإلى المطار هي جزء فقط من الخدمات التي تميز Toscana Village Resort عن باقي الفنادق في المدينة. تتضمن كل غرف النزلاء وسائل الراحة والتسلية المصممة خصيصاً لضمان الراحة القصوى للضيوف. سواء كنت من محبي الرياضة أو كنت تتطلع لتفريغ عناء نهار صعب، ستجد خدمات ذات مستوى عالي بانتظارك كمثل مسارات المشي, مسار جولف - ضمن 3 كم, حمام سباحة خارجي, تدليك, مسبح (للأطفال). إن كنت تتطلع إلى إقامة مريحة وهادئة في Whitsunday Islands، فستجد في Toscana Village Resort بيتك الثاني. Will definitely go back to Airlie and wouldn't even considering staying anywhere else more. So hospitably, clean and and accommodating. 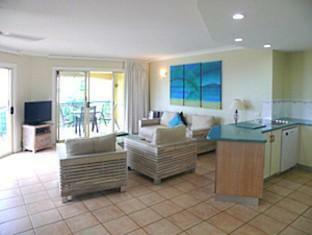 Great apartment with verify good ocean view. Kitchen is nice with everything you may need. The washing machine is very old. All required ammenities and clean. Staff lovely. Rooms are a little outdated and difficult for parking cars like 4WD. I have booked the room for two days with one day in-between going to sailing. The staff noticed that and actively offered help by allowing us to leave our luggages in the room we are staying at. Really thanks a lot for the nice staff! The room is good and the hotel is near the supermarket which is very convenient. Our stay was fantastic. Our room was ready at midday. Once we settled in we spent a few hours by the wonderful pools and waterfalls. We walked everywhere from there. 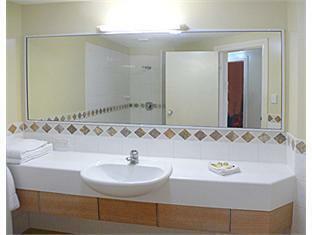 The apartment was very comfortable, spacious, clean and accommodating. Would certainly stay there again. 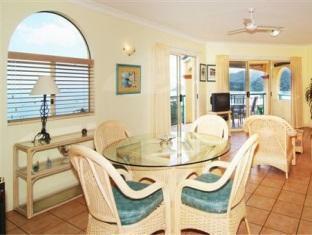 Excellent, great location, beautiful views and spacious apartment. Beautiful gardens! Nice gardens, Pools. Gated entrance. convenient for great barrier reef excursions. apartments do not have a lift. gated entrance did not have enough access cards. The location of the resort is very good as it only 15 minutes walking distance to the main street for all living needs and also to Airlie Beach. The view from the room is excellent! Room space is big enough for 8 people. The reception desk is helpful and cheerful for any needs and booking tours.. Overall, it's a good place for a vacation when compare with the price. Der Abzug bei der Sauberkeit kam durch das auftauchen einer Riesenkakarlake am Abend. Diese entfernten wir, danach war alles ok. Dies kann natürlich vorkommen in einem tropischen Land. Sonst ist die Unterkunft sehr zu empfehlen. God standard,antastisk utsikt,nära centrum och mycket servicinriktad personal. ett underbart hotel med härlig atmossvär. rummen var stor och välutrustade. utsikten över havet är kanon. det var nära till allt(affärer ,bad, restauranger).mycket blommor och härliga små poler i olika nivåer. vi hadde tillgång till fri internätt. personalen var underbar, det fans bara möjligheter. vi tar gärna in på detta hotell. 프로스파인 공항에서 코치버스를 타면 숙소 앞에서 내려준다. 높은데 위치해서 그런지 몰라도 에얼리 비치가 한눈에 들어오는 전경이 일품이다. 부대시설도 만족 스럽지만 신혼여행자들이 가기엔 너무나도 큰 방이 흠이라면 흠이다. 가족끼리 가기에 좋은 리조트이다.